“BOAT FLOOOAT! BOAT FLOOOOAT!”, the guys on shore yelled out to a river raft filled with pirate hatted young men. “BOAT FLOOOOAT!” the pirate river rafters yelled back. “YELLOW BOOOOAT!” the shore guys yelled as, yes, a yellow boat drifted by. A couple minutes passed and a yellow and grey raft appeared peopled with Vikings or maybe elk. Attached in a row to the raft like a stumpy tail were three inner tubes with some more Vikings/elk. “TUBEEEEERS! TUBEEEERS! the shore guys yelled displaying yet again a keen eye for the literal description of what passed in front of them. There was something quite wonderful about this full throated yell of the obvious that made me giggle like a schoolgirl. Next in line was a boat with some guys, a gal and a dog named Duke. He looked like a big brown canine version of Leo Di Caprio on the bow of the Titanic. Okay, so you get the drift of the drifting boats at this annual affair that resembles Mardi Gras in that it involves drinking, rafts dressed up like floats, and, of course, 8 hours into it, the showing of the breasts by the female pirates, Indians, and cowgirls. A few days later and I’m walking into a cozy little bookstore in Livingston, Montana filled with used books where a book reading is to take place. 25 folding chairs are placed in the only available open space and in the back are chocolate covered strawberries, cheese, crackers, wine and Pellegrino. 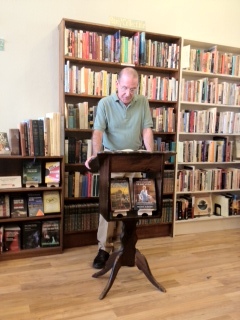 We are here to hear the author Thomas McNamee read from his new book “The Man Who Changed the Way We Eat”. It’s a biography of the New York Times food critic, Craig Claiborne. Tom has several very wonderful and well received books to his credit and also reviews books for the New York Times. His “Alice Waters and the Chez Panisse” is a riveting description of how Alice came up with the idea of farm to table and had an incredibly wild and fun time doing that in Berkeley, California in the 1970s. Tom has been coming to Montana to write for over 15 years. There is something in the air here that lures writers of all sorts. So here I am at a literary event sipping wine instead of chugging rum coolers and sitting on a folding chair instead of lounging in a rubber boat. I sat and listened to a wonderful description of a dinner Claiborne had eaten in Paris with over 21 dishes and the finest wines in the world including a Chateau d’Yquem and 1917 Chateau Lafite Rothschild. I loved listening to the story of “The Feast” and discovering the snobbiness of Claiborne. But I have to admit, I had to suppress the urge to yell at the top of my lungs, “BOOOOK GUUUUYYY!”, throw back the rest of the wine while pulling up my top to expose my breasts. That’s me and my life. I’m always trying to bridge the gap between different worlds. Can it be done? Can we merge the upper class fly fishing dignitaries who fly in on private jets with the boat floaters? Can we merge the riders with the writers? Next year I am going to propose a combination of the two types of events. We should have done it this year because local writer William Hjortsberg published his epic biography of Richard Brautigan whose “Trout Fishing in America” was a must read in the late 1960s. Brautigan ended up in Montana where he befriended the bad boys of the Paradise Valley including Hjortsberg, Tom McGuane, and Sam Peckinpah. Here’s an idea: “Gatz” Hjortsberg should have been the Grand Marshall of the Boat Float. Don’t let anybody say there is no poetry in a day of floating the river with good friends. Don’t say there is no way we can all actually understand each other and get along. Dream that impossible dream. Yup, don’t let anybody tell you that you can’t sell fill dirt and croissants because your marketing message is confusing. Tell them to get a life. Found the band who recorded the first cut on this video. It’s The Nadas “The River” on their album “Transceiver”. Note: Once I figure out how to transfer my I Pad movies to my desktop or figure out how to edit on my I Pad better than I do now, I will have better music on my own videos. I need an assistant. This entry was posted in Montana Life, Social Commentary, The Cowgirl and the Contadina and tagged Boat Float, class warfare, Craig Claiborne, Montana, Richard Brautigan, Thomas McNamee, Willilam Hjortsberg, working class, Yellowstone River. Bookmark the permalink. what a heart warming post, thank you so much. I have a friend who has proposed to write a semi-autobiographical book involving him (something of an egalitarian) and his childhood friend (a successful capitalist). I can’t wrap my mind around the enormity of the project. I think your project has a better chance of success, though I can’t imagine how the proles will not be sorely tempted to dump the elite in the water! I appreciate your feedback more than…well…almost anybody. I wasn’t sure I was on the right track, but at least it’s my track. It would be a dream of mine to see the proles mud wrestling with a former treasury secretary or former network anchor. So I’m going to talk to the economic development team here in town. They have the usual suspects i.e. land developers on it with a few well meaning folks who want to save our town which is losing business after business. They need to include a young man who arranged to have an Austin band “Mickey and the Motor Cars” play for the Friday night part of the Boat Float. It was pretty successful. He has arranged other bands to come and play. Meanwhile, the same old group had a fundraiser for the “Cowboy Hall of Fame”. Not nearly as successful. They need to put this young man on the development aka save our town committee. Shake it up a bit. You got me to thinking – read the Wikipedia entry on the Feast of Fools and let me know what you think. Quite interesting how the feast was stamped out by the Protestant Reformation after the Catholic Church had been complaining about it for centuries. It’s all about hierarchy inversion, which is most likely why I’ve not been able to find any work on this aspect of the festival. I’ll have to do some more digging. Yes, a “Feast of Fools” as a time to reverse positions and elevate the low to high positions like Mayor. And thanks for the reminder about the Ehrenreich book. I’m about one-third of the way through Ehrenreich’s Dancing in the Streets: A History of Collective Joy and it is really fascinating. If you haven’t read it, it is worthwhile reading! Those peasants have to be constantly told that they aren’t worthy of governing themselves. Bad, bad, baaaaad …. Try Dancing in the Streets: A History of Collective Joy, by Barbara Ehrenreich. Looks like it might be interesting reading. Ehrenreich is on to something, though her book could have used a better editor. Intrigued, I searched on the phrase “potlach hierarchy” and that led me to searching “gift economy”. Bingo!!!! Here is a site that I just found that I think is excellent – I’m sooooooo ready for this kind of thinking! Re: Obama/Romney – will you goddamn children just grow up?? Funny, I met Lee Camp years ago at a media conference and kept in touch. Should I read any article in particular? No, no particular article – all of them have nuggets of wisdom in them. You might want to click on the Evolver Network icon on the right sidebar – it is the one that looks like a left parenthesis and a plus sign. There is a link on that page that takes you to a conference with David Graeber and Charles Eisenstein on August 22 in NYC. Also a link to the EvolveFest in Phillipsburg, NJ over the Labor Day weekend. This generation’s Woodstock?